National Weather Service warned of weekend showers and possible thunderstorms, which can be turbo-boosted by the heat of the lava flow causing updrafts and instability. After a flurry of articles marking the eruption’s 10-week mark, Hawaiian news outlets are taking a weekend break. And Dispatches From Volcano has a good essay today on the naming process for Fissure 8, reflecting on how long it took for Pu’u O’o and other past eruption features to receive their official name. Friday evening, July 13, 2018, 6:00 pm – Kilauea's east rift zone overflight: A tiny island has formed near the north end of the ocean entry in Kapoho, as a subaquatic tube feeds a flow on it. Friday evening, July 13, 2018, 6:00 pm – Kilauea's east rift zone overflight: Fissure continues to rage on, feeding the massive perched channel of lava in Leilani Estates. Friday evening, July 13, 2018, 6:00 pm – Kilauea's east rift zone overflight: The braided channel glows with intensity as night falls over the eruption zone. Friday evening, July 13, 2018, 6:00 pm – Kilauea's east rift zone overflight: Lava exits fissure 8 via a narrow channel, creating a multitude of textures as it transitions into the perched channel. More photos of the tiny island, braided lava channel, Fissure 8 and flow approaching Pohoiki on his lava update blog post for this overflight. USGS: It’s been done with ROVs, but mostly with calmer eruptions in deeper water. At the ocean entry now, the water is still very hot and acidic and there are littoral explosions happening, so it would be very hazardous for a diver. Q (Mark Landers): This afternoon the lava flowing out of #8 was pulsing wildly, it would rage and splash higher than I’ve ever seen it then go nearly flat. Ever the optimist I think any change is good. I want to believe that it is like the last drops of water flowing out of a hose; some water, some air. Could this be possible? USGS: Yes, we were documenting swings of ~5 minutes between some waxing and waning of the fissure activity. It’s not clear what this means, although the “last drops from the hose” is a possibility. Eruptions usually end with a whimper and not a bang, so some sputtering is expected during the closing phases of eruption. But eruptions also often turn back on after these sputtering phases, so it’s too early to say what the outcome of this will be. USGS: It appears so. There is probably still molten material in the original channel that’s making its way seaward – it’s just not visible. USGS: Yes. Lava can thermally erode downward as it flows – that’s a well known phenomenon in lava tube systems. USGS: Not necessarily – it’s volume and duration more than height that form a big cone. But, fountaining in the fissure eruptions in this area has been much higher in the past, up to 500 m (over 1600 ft)! USGS: As long as lava can spatter up over the edges of the cone, it can add to the cone’s heigh. Right now it’s mostly roiling within the crater, so the growth phase for this cone has paused. USGS: Indeed, they do. The land does not change hands, regardless of the volcanic activity. Q (Allan Lowe): Does the lower channel volume create to a lower eruption rate? If so, is there a compilation between a lower eruption rate and the longer interval between summit collapse events? Also, how does the current eruption volume compare to the average output of Pu’u O’o? USGS: The numbers we get in both places are a little squishy. At the summit, we determine the volume change by looking at the change in topography (basically, before minus after). That number is around 500 million cubic meters. At the lower East Rift Zone, we use a combination of topographic change and lava flux in the channel to estimate something in the same range. but there is a lot of uncertainty since, for example, we don’t know the depth of the channel. It’s a critical set of numbers, but surprisingly hard to get accurate results! Q: Has it hit the water table yet? 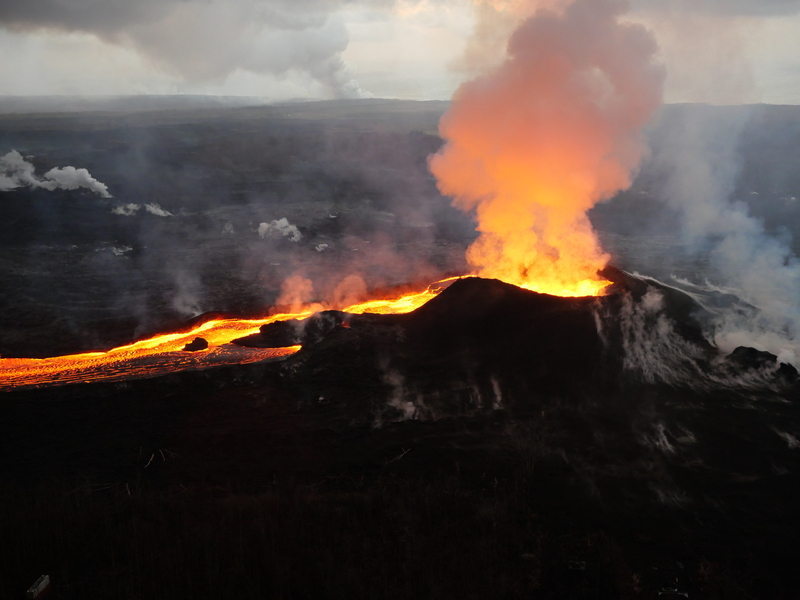 USGS: The lava level at the summit actually dropped below the water table back in mid-May, shortly before the small explosions began from the former summit eruptive vent on May 16. Q: ISS is passing over Kilauea next week; can you ask someone to take pictures? We can still see the Earth’s fury from @Space_Station as the lava continues to flow from #Kilauea. Nice geeky thread about magma/lava on Facebook…. 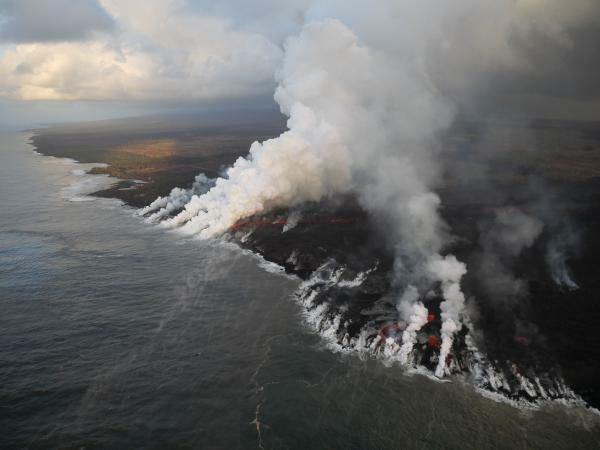 Dane Dupont: What was the date or fissure that lava from Pu’u O’o was first detected? I remember the was reports about a mix of ‘new lava’ coming from Fissure 17, but heard that was retracted. Just can’t find much about the composition of the lava. 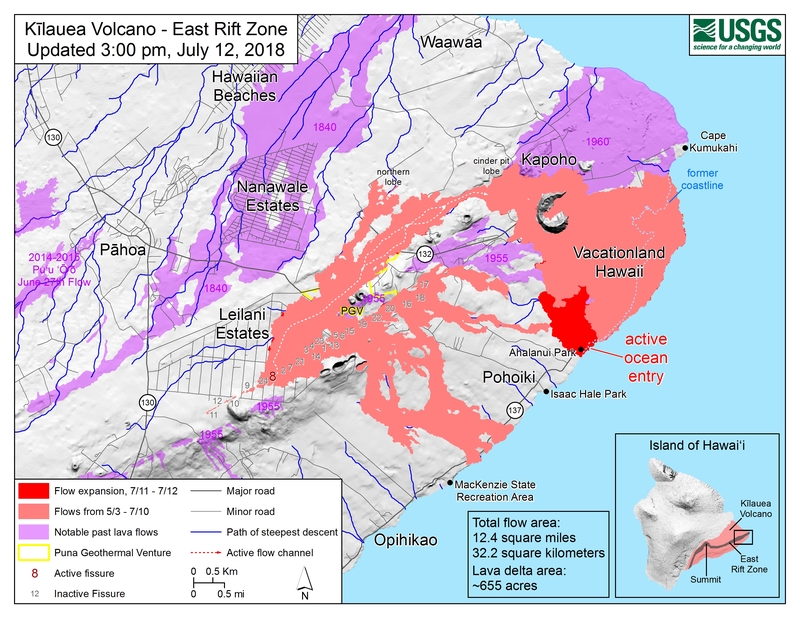 USGS: Actually, Fissure 17 was a weird one — it was erupting a very evolved composition that had clearly been sitting in the rift zone for a long time (older than 1955, which was what we were seeing out of the other fissures). As we recall, the first sign of Pu`u `O`o composition was in mid-May (around May 12 or so) and came from the Fissure 20/22 area, but that part of the story will become clearer once we’ve formally done the full geochemistry on all collected samples. Charles Gregory: This really makes me wonder how a body of magma can be kept at a liquid temperature for more than half a century without a direct source of heat to offset the slow shedding of heat into the surrounding rocks. Certainly, rock is a ‘good insulator’, but is it really so good that magma can stay liquified for so long? If so, does this explain post-shield-stage volcanism? That is, long after the volcano has been transported away from the hot spot, is it stray near-surface magma bodies being ‘squeezed to the surface’ (or released?) by tectonic events? How close to the surface? How close to the surface as the 1955 magma stored? USGS: We’re not really sure how post-shield volcanism works, having never observed it. That’s one of the many poorly understood aspects of Hawaiian volcanoes. But magma can stay liquid for a long time beneath the surface. Back in about 2005, drilling in Hawaii intersected a body of very old magma (a quite-evolved dacite) at about 2.5 km depth! Allan Lowe: Where was that drilling done? USGS: That was near PGV. Arthur Wierzchos: How old might a quite evolved dacite be? USGS: Good question — we don’t really know. Probably at least hundreds of years, and quite possibly thousands. Oh look! rumor whack-a-mole is back! Q: Will volcanoes be more active when a lot of planets are lined up on one side of the sun June 19? Also it’s Grand Solar Minimum. USGS: Planetary alignment has no effect on volcanoes. Even you aligned all the planets, their combined effect would only equal about 2% of the Moon’s gravity, and we already question whether the Moon (which is a lot closer) can have an effect on volcanic activity. I hope Marzo just does what needs to be done, although he’s been pretty good about going through official channels to get permission for his animal rescue efforts from the areas cut off by lava. Wow, what a grim note to end on. Here’s a coda. … life finds a way.